Sapphire crystal is extremely hard and scratch resistant useful for the visible and ir spectrum. Optical sapphire is made to a random orientation or cut to a specified orientation. It has excellent thermal conductivity at low temperatures allowing single crystal sapphire to be used in many diverse fields requiring thermal conduction and heat radiation.Sapphire has high dielectric constant and is resistant to common chemical acids and alkaline. 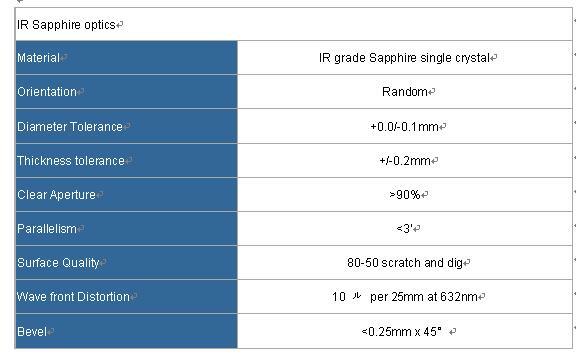 Optical sapphire has no coloration and with a selection of grades of sapphire transmission ranging from 170nm to 6 microns . We can supply sapphire windows, lenses, prism and dome. The sapphire optics can be made in various shapes, sizes and forms ie squares, plates, rectangles and discs, with various processing to the faces and edges.